Officially an â€œinternational liasonâ€� for the Shogunate, Mizu Kage prefers to conduct her diplomacy with deadly sai blades. Three times, she â€œnegotiatedâ€� misguided Reich soldiers away from betrayal of their tentative alliance with the Shogunate. Mizu Kage was last charged to collect information the Shogunateâ€™s Reich allies have been withholding. As she works toward the completion of her task, Mizu Kage moves like a whisper of wind through night trees. With her sai, shuriken, and happo, Mizu Kage can decide to tread a path of blood or shadow. Mizu Kage may feature in a team made exclusively from Shogunate characters or, according to the Nippon Accords, may partner with forces from the Reich. 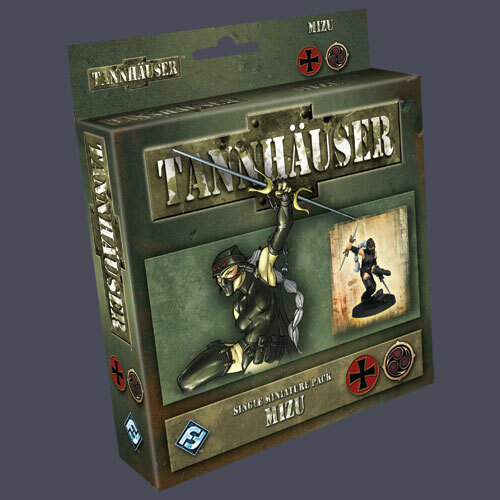 Mizu arrives as a single figure pack for TannhÃ¤user, complete with a sculpted and painted miniature, character sheet, tokens for her equipment, and a rulebook with a unique scenario designed to pit Mizu Kageâ€™s skills against the Union or the Matriarchy. Other products in the "Tannhauser" series.